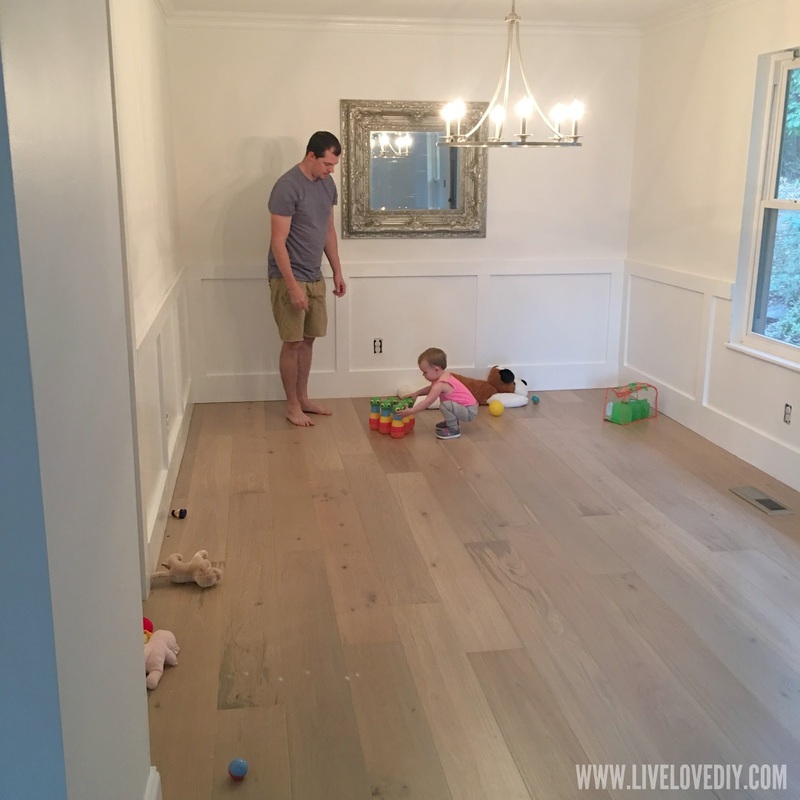 LiveLoveDIY: Our new hardwood flooring and a living room reveal! 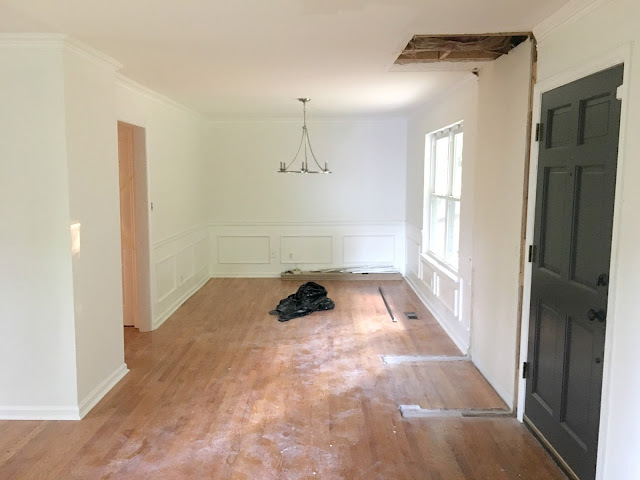 Also, I know that in that last post I made it sound like I would be sharing the flooring reveal soon, and then it took me three weeks to eek out another post. You guys, this is my life now. I make grand plans to do things, and then I am slapped back to down to earth with the reality that I have about an hour of productive time each day. And it's usually after 8pm, when I don't feel like being productive. The good news is that you guys seem to totally get it. I might not be alone in this struggle. Plus, for those of you following me on Instagram, you've been watching me spend nearly all of my free time making art, and it's really becoming a new thing I am loving to do, and I'm not really sure what I am doing or where it is going, but I think I will blog about it in my next post. Just wanted to quickly update you on that. Anyway, today is the day: flooring, living room, and dining room reveal....let's do it! Here are a few before pics from when we bought the house. It wasn't awful, it just felt so dated. So Tuscan-inspired. So soul crushing. I kid. It's not that bad. But it is. You understand. 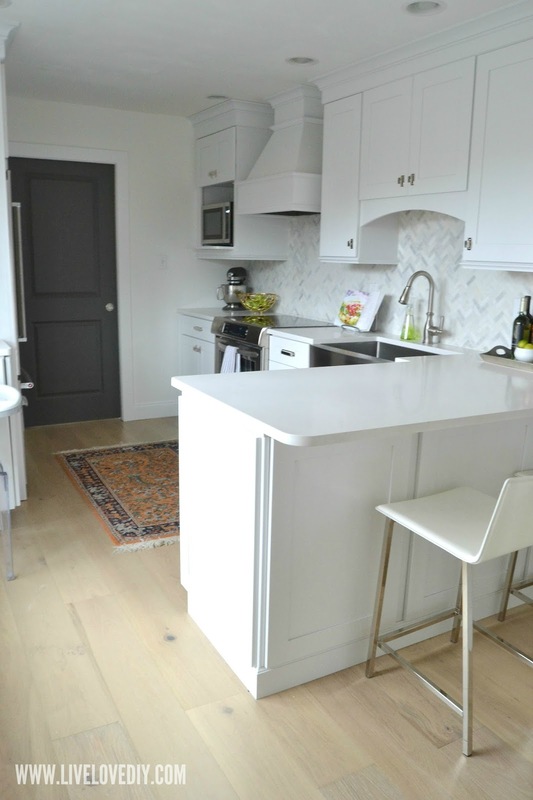 The flooring was a mixture of skinny bright orange hardwood and some awful brown tile in the kitchen and bathrooms. I thought about keeping the existing hardwoods and just running them through the rest of the house. Everyone told me to keep them and just refinish them. Everyone. Jesse was good about reminding me to listen to myself. I am really good at letting others drown me out sometimes. For about a month (while we were waiting on our contractor), I got a chance to live in the house, with some of our stuff, and just see how I felt. I went ahead and painted all of the walls white, and painted some of the woodwork, and the more I worked on stuff, the more my vision came together in my head. I started bringing in floor samples. And that ultimately helped me make a decision. I think it could have been beautiful either way, but I'm glad I went with what I really wanted, which was wide plank flooring. Here are a few more before pics. These are from before I painted the walls. Remember that annoying coat closet right by the front door? It kind of cut the dining room off from the rest of the room, and although it provided storage, it just felt off to me. See how much it just eats into the room? I made the decision to remove the closet, and I am so glad we did. It resulted in some additional drywall and trim work, but it was worth it. The original hardwoods weren't run under the closet, so that would have been an issue that we would have had to patch if we had chosen to keep them, so minor headache avoided. Right around this time, I also painted the front door black (Sherwin Williams Urbane Bronze) and updated the chandelier in the dining room. It was from Lowe's. I used them in my last house, too. Nothing fancy, not expensive, just a nice clean update. The previous wainscotting was just painted on for the most part, so that got removed. I think I mentioned this before, but I didn't intend to tear it down just yet. I was going to just live with it until Jesse had time to rebuild it, and then Jesse told the contractor to just go ahead and tear it off, and I came home one day and was like, crap. Time to drop everything you're doing and build some wainscotting, Jesse! Of course, the actual timeline was something like: Move in with my mom for 6 weeks while entire house gets torn apart. Pop in and out of house biweekly to take photographs and make sure things are going as planned. 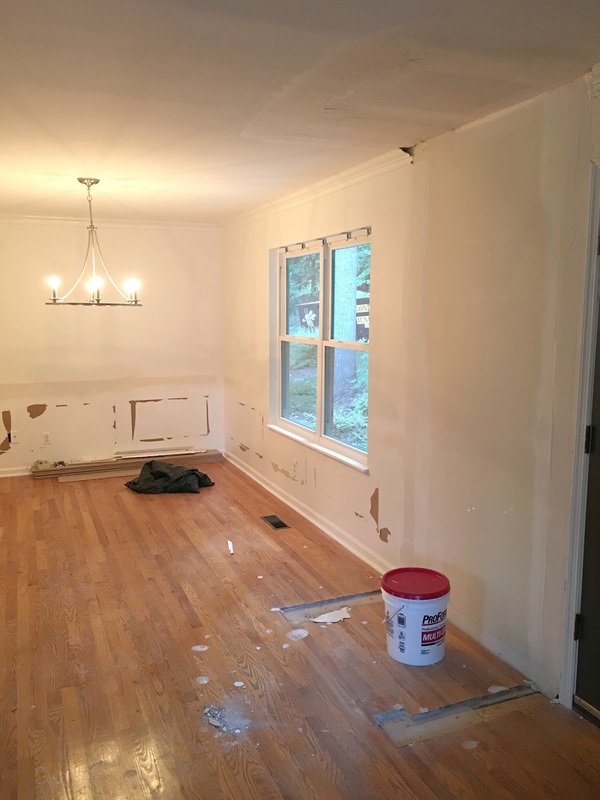 Move back into house when flooring and kitchen is done. Nag Jesse to start building wainscotting 48 hours after moving back in. So, back to the flooring. 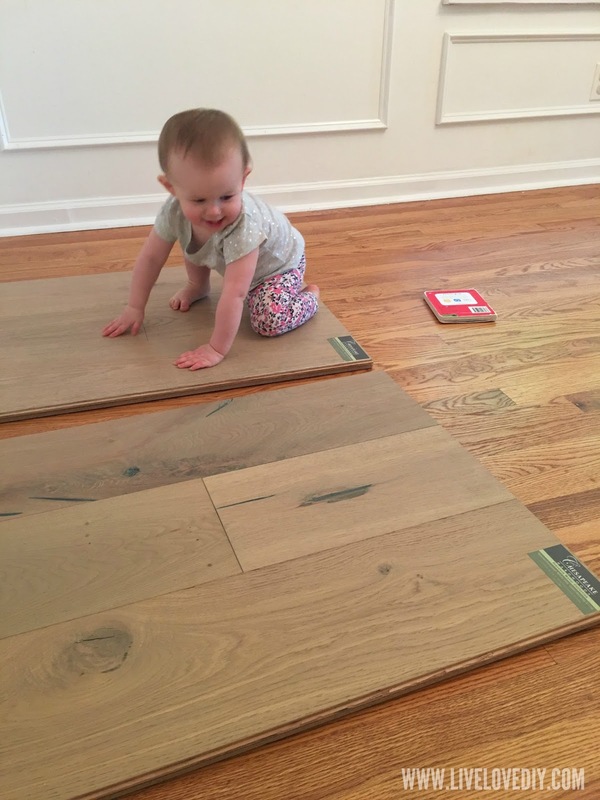 Before the contractors starting demo-ing everything and we had to move out for 6 weeks, Ava and I would go to flooring stores during the day and haul a bunch of giant samples home. Not an easy feat to do with a toddler. Luckily, people are nice and will usually help you lift stuff into your car when they see you trying to also wrangle a tiny toddler beast. I brought home all sorts of different samples, probably 20+, and there were all sorts of widths and colors and finishes. Ultimately, we narrowed it down to three choices that we loved the most, all of which were a very light wash, wide plank hardwood. Ava was a very good assistant during this time. For weeks, I just lugged the samples around the house, squinting at them. And of course, the one I ultimately chose was the one I picked out and brought home first. I never trust my gut right off the bat. It's annoying. The ultimate winner was Provence Manor European White Oak in River Rock in the 7.5 inch plank. We got them from Heartland Flooring in Knoxville. I've gotten flooring from them twice now, and I highly recommend them. And no, that is not an ad. They have no idea I even exist. Once the old flooring was gutted, we discovered that all of the subfloors needed to be replaced. The old ones were in really poor shape and there was even some rot (likely from water damage in the past). It was one of those annoying things you don't know is wrong until you start ripping stuff out. So, that bought us an extra week at my mom's house and cost us more money. That's how it goes with renovations, I have discovered. All of the trim was off everywhere and everything was a bit of a disaster, but I was so excited by the progress. The lighting is terrible in all of these photos, but just roll with it. I've loved these floors from the minute they went in. The main level of the house is kinda small, and I just wanted everything to be light and airy so that it would feel more open. I love dark, warm floors, too, but I know myself, and I knew that these floors were the way to go. It's fun to look back through all of these photos, because even though it seems like yesterday to me, it was really almost half a year ago now, which is a lot of time when you have a toddler. She already seems so little in that photo. So, once the flooring was done, we moved back in and Jesse began working on the wainscotting. We didn't build the wainscotting in the old house (I just painted it), but I wanted a similar look, and Jesse assured me he could build it. He's handy and never afraid to tackle a project, even if he's never done anything like it before. It's a blessing and a curse. I think he regretted his decision about 7 hours into this project. Also, we were using this cheap wood to build the wainscotting so it looked awful going up. I knew we were going to paint it, so it really just made me laugh. Like, are we building a trailer? Jesse, I feel like it's trailer paneling. And of course, we had to do it during the day so that we had daylight, and Ava was the MOST helpful. Jesse ultimately ended up modifying my design for simplicity's sake, which I was in full support of at this point. And even though it wasn't painted yet, I was proud of his handiwork. Not too shabby for someone who was just like, sure, I'll figure it out. Once Jesse was done with his part, I agreed to caulk and paint it, and so it sat like this, driving me nuts for a few days. Because mama tired. We learned a lot about how to do this and we could surely do it better and easier if we did it again, but this will live here on this wall until end times. Eventually, I primed and painted it, and it took so many coats of paint. It is what it is. But there are few things more fulfilling that when you get to that point in a project where you can finally see your vision come to life and you want to cry and laugh and never do any of the things ever again. It happens with every project I do. The exhaustion, the joy. And, that's the wainscotting segment of this post. We eventually moved our table back in around Christmas, just in time for Ava to help me decorate. Curtains, son. Build me curtains. I hung them all the way up to the ceiling and I swear it makes the biggest difference of anything I did. Isn't that annoying. I painted that old thrift store TV stand with some chalk paint (I used Rustoleum chalk paint in Country Gray, and I love the color. That's an affiliate link). I like the new color so much better than the white. Looks more adult-ey. Here are a few more photos of the room. Real talk, I moved Ava's rocker in here because, comfort. And there are toddler toys everywhere. And I wouldn't have it any other way. If you look closely, you can see Ava sitting in the window, reading a book, behind the curtains. My living room has never been a happier place in all my life. I bought this little wooden toddler table (affiliate link) and painted it to match our actual dining room set, and she literally spends half of her day at that table. I painted the top of the table with black chalkboard paint, and it's been a real hit. I also made some more gold leaf art for the living room. I shared a lot about it on Instagram, and a lot of you guys were asking for a tutorial. I don't think I'm going to do another tutorial right now, but I did a pretty thorough gold leaf art tutorial in this post from last year if you are curious. I shared a little bit about how we make the frame, too. Anyway, kinda loving how that one turned out. I eventually want to do a big gallery wall right there, but for now, I need something simple that I can just put there and not fuss with. Here's the dining room. I'm so happy that we took out that closet and went with the wide plank floors. I still have some work to do on this space, but I feel really good about it so far. That's an old thrift store mirror I painted. I eventually plan to hang some art in here, but baby steps. So far my color palette is pretty neutral, per usual. I get the occasional comment from people telling me to use color. I get it. I really do. But, I live here, and I have to do what makes me happy, which is neutral. I have enough hot pink and primary colors floating around my house right now in the form of toddler toys, so an otherwise neutral space feels so calming to me right now in this phase of life. And the honest truth is that my passion for decorating just isn't what it used to be. Lately, I am really into this whole mom thing and also making art. And also still renovating and DIY-ing, but like, that's a lot different from decorating. Decorating has never been my specialty, and these days I find myself devoting way less energy to it. I try not to resist these changes, and just follow my interests, because I believe that as long as I'm doing that, life will lead me in the right direction. So, before we go, let's compare a few before and after angles of this space so far. And that's where we are today. It truly feels like a breath of fresh air. And sometimes smells like toddler sweat. Oh my goodness! You have been very busy. This is so lovely and totally you! Great work and thanks for sharing! Love it! Taking out that closet was brilliant! Really opens the space up. Looking good! You are hilarious. The floor is killer. And I'm glad you took out that coat closet. LOVE your blog! Love those floors!! Sure wish I could afford to do something like that, they are just fabulous! It looks great. I really love the before and after of the angle from behind Ava's rocker looking toward the french doors. What a difference! But what I can't believe is how great your sofas look in your new space. They are so classy and beautiful! Where did you get them? Beautiful! Just beautiful! Love your choices. Would you mind sharing where your sofas are from? Love them. I love your art on Instagram and your kitchen and curtains and everything else you've shown us but especially that you are enjoying motherhood and that you are listening to your inner voice and following your heart. Congratulations on all you are accomplishing! Love your home...what a beautiful transformation. Taking out the closet was a fantastic idea....it opens up the room and really showcases that big window! Love, Love, Love! What a beautiful home! You've done such an amazing job so far! It's a gorgeous space! It does feel so much fresher. I've been wondering what Country Grey looks like out of the can (so odd that they don't have samples) so thank you for that. And I loved what you said about following your interests. I am so with you on that. I love it! Tell me about those curtains in the living room ? Huge improvement. Love those planks! Absolutely the right choice for this house. Only "itsy" negative from moi is...please move the sofas off the wall! Give them a couple of inches of space so the setting looks more cohesive. Pet hate. Mwah ~ heather from Oz. Love this!! ❤️ You are on fire!!! The pillows are gorgeous materials. Did you make them the same way you did previously, or are they recovered? What a great post to read! Been there and totally get the during lows and after high. It looks absolutely fabulous and a home not a show home. Great job and you both make a great team plus adorable Ava. Looks great!! Where did you buy your area rug in the living room? This looks so good! 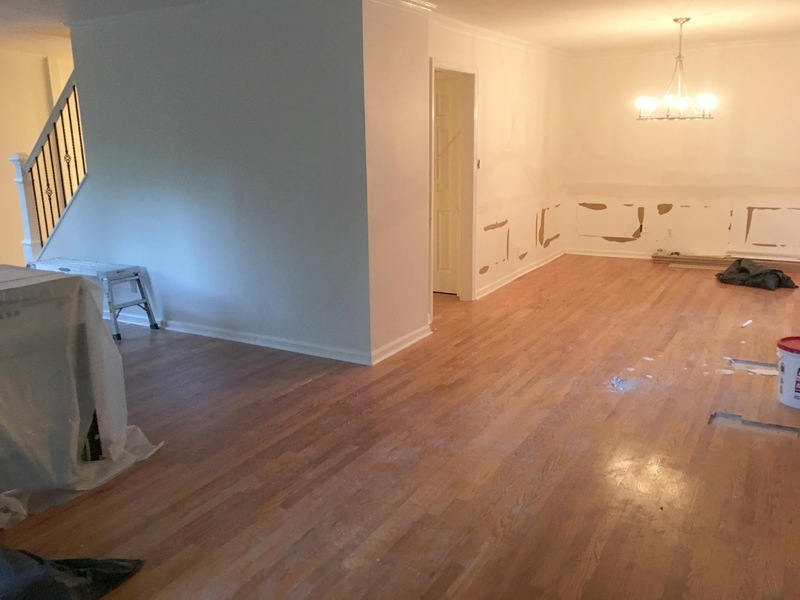 I am always amazed by what some paint and flooring can do to brighten up a space. 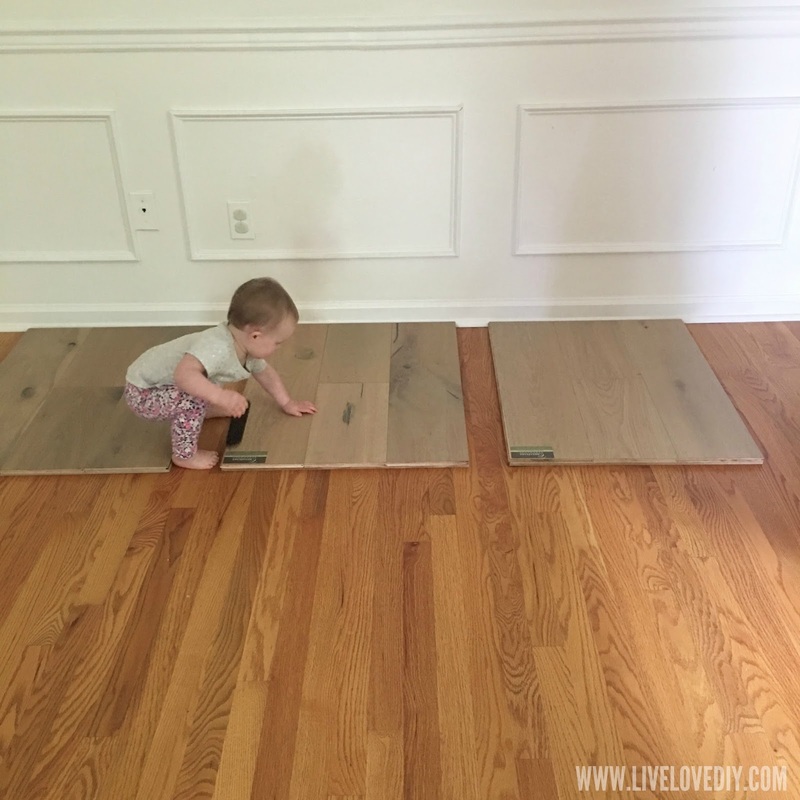 PS...we have that same "before" wood planks all throughout our house. Maybe one day.... :-) I also love seeing your real life with Ava's toys instead of a boring, stark home. Awh just simply beautiful! And I love it when you throw in a before shot. Beautiful home, beautiful family. Love it:-) Cheers. Love watching your style evolve, always wondering what new vision you will have for your space, I have done lots of renos with my husband on an acreage, the learning curve is tough but the results are like creating a masterpiece- and the feedback is confirmation. Great job! Always enjoy watching your style evolve, I've been following you for a few years now,we renovated an 80s acreage and learned so much but it was a great education! We have similar taste so it's always a huge treat to see your progress- fantastic work! Where is your gray couch from? The update is lovely. I live in a house that is very similar to your last house. I got so many ideas and inspiration from you, thank you! I absolutely love it. What a transformation! And girl, if neutrals make you happy, keep it neutral. You do you, boo. I remember your love/hate relationship with the hot pink rug in the dining room at the previous house haha. What an amazing transformation!You should be so proud of yourself! Don't feel guilty for being tired...show me a mum who isn't!!! (myself included). You are so lucky that your husband is so helpful! Enjoy your beautiful home! 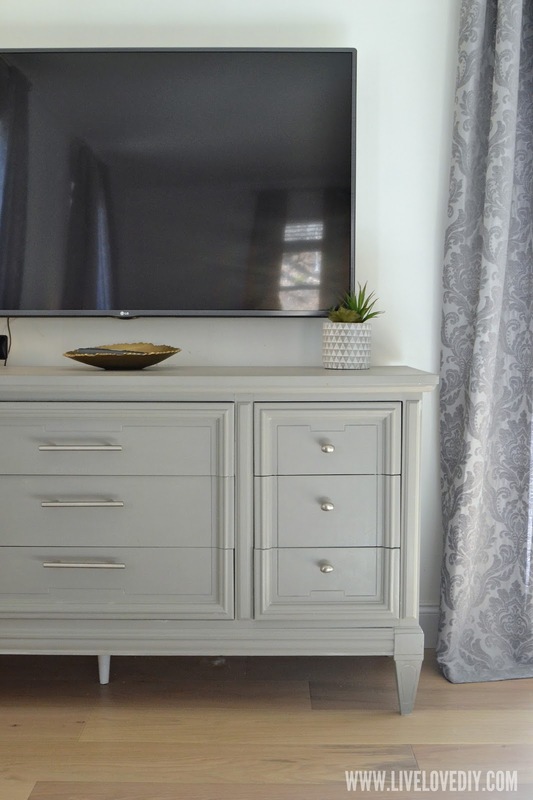 Love the floors and the color of that tv stand. I need to get braver. I have cherry wood cabinets which are very pretty but not my style. I think I should paint some of my furniture but I never do. Some day. I say this every time, but I love your posts. I mean, your house looks amazing and your hard work really payed off, but what I truly love is how insightful you can inadvertently get while seemingly just taking about paint and flooring. It's refreshing and inspiring. Love love love!! My husband and I are finally buying our first home! I am looking at your home for inspiration! What colour did you paint the walls and wainscotting? Are they the same colour or different? Your floors are great! I have the same orange skinny plank floors. Love dark floors but they really show the dust. Light is the way to go. Yours are amazing! Um, there's a colorful bowl of apples on the table. Is that not enough? I absolutely love it! It's gorgeous and soo worth the wait! Your fans are patient for a reason, girl! Keep up the amazing work, but more importantly keep doing what makes you happy! Love your design style! Can you please share your dining and living room paint colors? Thanks!